Due to the cost of this screening (N7000 as of 2015), it may not be favorable to those who has less than 500 or 1000 chicks as the case may be. By taking a look at the sample below you might see a need to rethink your current vaccination plan if it is not effective. Below is the result from the lab test. Please find below, the result of Hemagglutination inhibition test (for ND) carried out on serum samples of chicks received from your farm. Note that minimum protective N.D. antibody titre against lethal effect of the Newcastle disease virus is 1:16. See vaccination programme for details. My Interpretation: Titre as used here, is just a measure of how resistant the chicks are to Newcastle disease. The higher the value, the better and the minimum titre required is 1:16. The table above shows that out of 10 chicks, only 2 exceed a titre level of 1:16 – and this means disaster waiting to happen. If I delay vaccination for Newcastle disease, it will strike. 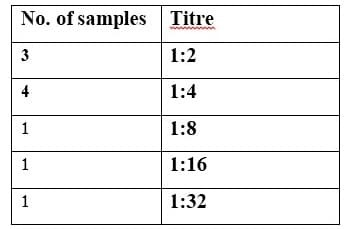 Below is the result of antibiotic sensitivity test carried out on samples from chicks submitted for analysis. Note: “Y” is a 40% disc preparation of tylosin (20%) and doxycycline (20%) with synergistic actions, such as is found in Anidoxytyl®. “X” is a disc containing a combination of 5 antibiotics (oxytet, streptomycin, neomycin, colistin and erythromycin) as in Neoceryl® and the likes. ‘Z’ is a disc containing penicillin & streptomycin, as found in Anicillin® and the likes. Based on the A.S.T. result above, Administer Gentamicin to the chicks @ 10mg/kg body weight via drinking water for 5 consecutive days. This should be combined with Nystatin (500,000I.U./tablet) at 4 tablets per 1,000 day old chicks/day as prophylaxis against Aspergillosis. Tablets should be well dissolved in the drinking water. Adhere strictly to other biosecurity measures. My Interpretation: 2 disease-causing organisms were isolated from the chicks. They were Staphylococcus spp. and Candida spp. The test shows that these pathogens were sensitive to the antibiotics: Gentamicin and Anicillin® (penicillin + streptomycin). This means that if disease occur due to these pathogens, they will likely respond to these antibiotics. The test also shows intermediate sensitivity to streptomycin – meaning that this antibiotic will not be very effective. Finally, the pathogens were resistant to Fosfotrim, Oxytetracycline, ‘X’ [5 antibiotics (oxytet, streptomycin, neomycin, colistin and erythromycin) as in Neoceryl®], Furaltadone, “Y” [tylosin (20%) and doxycycline (20%) ], Colistin, Augmentin, and Enrofloxacin. These antibiotics are very unlikely to be effective if the above mentioned pathogens cause diseases. It is advisable that I avoid using them to prevent resistant strains from taking over my farm. I will also rotate effective antibiotics with different modes of action. a. I ND to III ND Lasota- Administer live and potent lentogenic strain ND vaccine through drinking water using 1.5 to 2 doses/bird. At week 15, birds should be primed with live ND+ IB combined vaccine, through drinking water before administration of oil inactivated NDV+ IB +EDS vaccine at week 16. Use intra-muscular route for the oil vaccines. b. I – III IBD Gumboro – Administer live and intermediate strain IBD vaccine through drinking water using 1.5 to 2 doses/bird. . When vaccinating through drinking water, use 1/4th of the total volume of water consumed on previous day by birds and this should be done after 3 hours of water deprivation( period within which they should be allowed to feed) so as to increase thirst. Vaccine water should be equally distributed in drinkers and the drinkers should be well spread in the pen. Where birds are to be vaccinated against coccidiosis, special attention must be paid to litter management, so as to avoid an outbreak. c. Ensure daily water sanitation except on days that vaccines are to be administered through drinking water. d. Ensure weekly weighing of birds so as to meet the weekly targeted body weight as recommended by the D.O.C supplier/Hatchery. e. Deworm and delouse at week 8 and week 16.
f. Daily spraying of low concentration of disinfectant in the midst of birds, is suggested. Diskol® should be sprayed at 7 mls per litre of water or Polidine at 20 mls/L of water. Avoid spraying when birds are taking vaccine water. g. Adhere strictly to all other bio-security measures and report all abnormal signs in birds to the laboratory as soon as possible. h. Anti –mycoplasmal drugs like Anitylodox® should be used for prevention of C.R.D. at weeks 2 ,6 & 10. 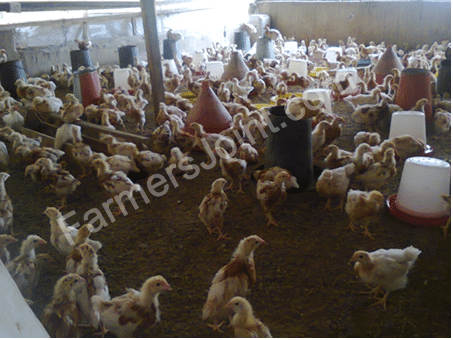 Where these birds are not vaccinated against coccidiosis, we suggest routine prophylaxis against coccidiosis by use of drugs like Dicoxin®, starting from day 9 of age to day 13 and to be repeated, once in 2 to 3 weeks while birds are still on the floor. i. Between 15TH -18TH: Administration of Polidine @ 4ml/10litres of drinking water daily on these days.